With the effects of the recession still having an effect on many businesses, it’s no surprise that many people are working long and tiring hours. Whilst working additional hours is essential for many people, it can often mean that relaxation and early nights are nothing but a distant memory. However, allowing yourself to relax and forget about the stresses of work and life is essential- otherwise you could find that you find yourself getting more and more stressed as time goes on. There are many ways of relaxing yourself after a hard day or week at work- from crashing out in front of the TV to enjoying a glass of your favourite wine. Another fantastic way of soothing yourself is taking a long, warm bath. 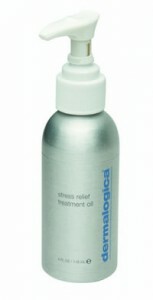 Dermalogica Stress Relief Treatment Oil is the perfect addition to a soothing bath, and can help you to completely unwind. Containing sandalwood, lavender, orange and clary sage, this oil not only soothes, it also intensely conditions skin- leaving it silky smooth.